Duetto is a trundle sofa bed that, for its elegance and refined style has nothing to envy even to the most famous and popular classic sofas. 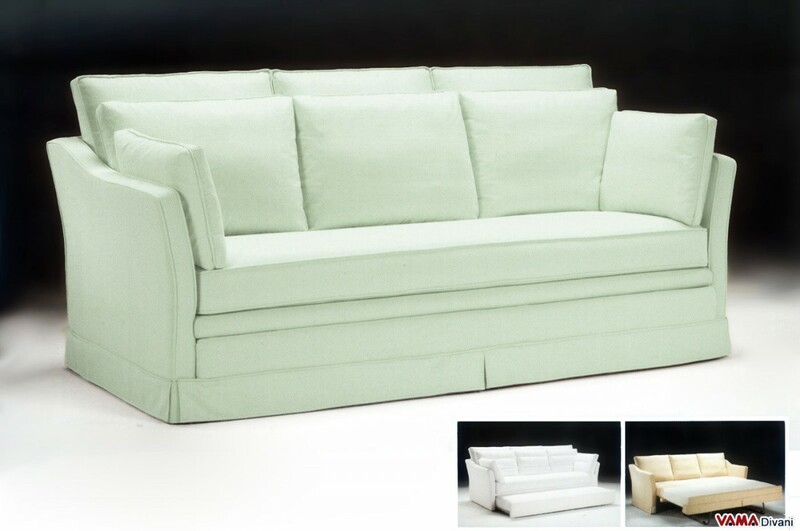 While presenting a fairly linear design and perfectly smooth surfaces, Duetto is the perfect sofa bed for more traditional living rooms; its structure, in fact, is clearly inspired by Vintage style, and some details, such as its elegant skirt and the shape of its arms make it even more a sophisticated model. An eye-catching detail of this trundle sofa bed is certainly represented by its soft cushions placed on its back and laterally on its arms; an important detail concerning style, but that also greatly enhances the convenience of this remarkable roll-out sofa bed. Entirely upholstered in fine fabric, Duetto comes with a completely removable cover and it can be dismantled, so it can be transported without any problem and its cover can be easily washed in your washing machine, being easily separable from the padding. Moreover, the internal structure of this sofa presents many interesting details: Duetto, in fact, is composed of 2 orthopaedic wooden slatted bases which, when opened, can also be used either as a double bed or as separate beds. The size of each slatted base is 80×190 cm; joining them, they can make a double bed of 160×190 cm. The mattress, however, is 15 cm thick. Upon request, Duetto can also be upholstered in microfibre or in leather.